Ah Costco frozen chicken breasts. I know many of you, like me, buy them. Sometimes it's hard to feel inspired by all those ice covered hunks of meat hanging around in your freezer. I'm always looking for something easy and fast. This is one. This sauce has sweetness, a touch of smoky from the bourbon and some tang from the mustard. I think it would appeal to many people in your family. Since you boil the sauce (and the bourbon) for one minute, I would think that you might be able to even serve this to kids. 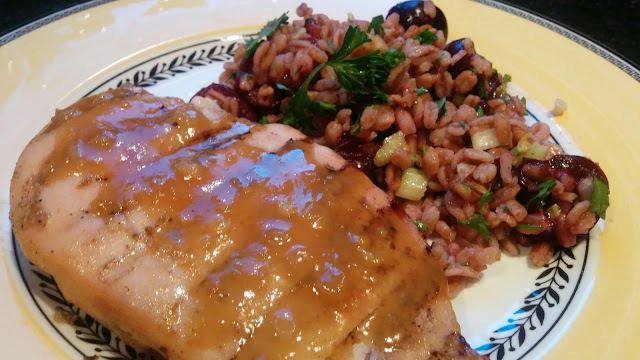 I served this with my farro, cherry and walnut salad, linked here. NOTE- I only used onions because I didn't have any shallots hanging around. NOTE NOTE- It sure is lucky I had enough bourbon to make this, LOL, you can see it's almost gone. 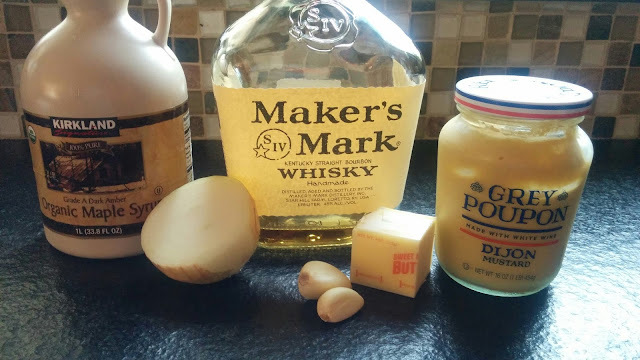 Cook onions (or shallots) and garlic in the butter until they soften, add bourbon, mustard and maple syrup. Bring sauce stuff to a boil, for one minute. Let it cool. Use half the sauce to marinade the chicken (adding a 1/2 tsp of salt to the marinade too), let sit in the fridge for a couple of hours, or even overnight. Grill over hot coals, or a smoker until they are done to your liking. Serve the rest of the sauce with the cooked BBQ chicken. Need some other ideas for Chicken Breasts? 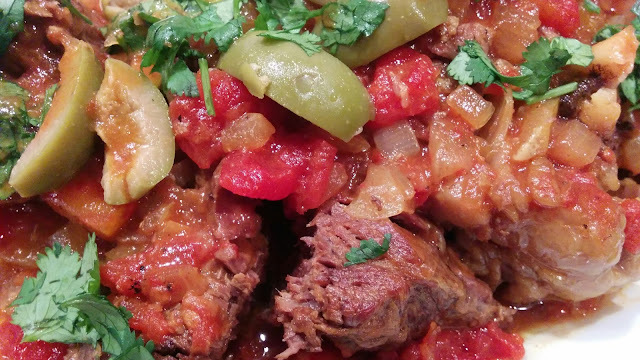 Lemony, salty, briney- yummy exotic flavors with all the comfort of Mom's pot roast. Okay, maybe someone's Moroccan Mama. 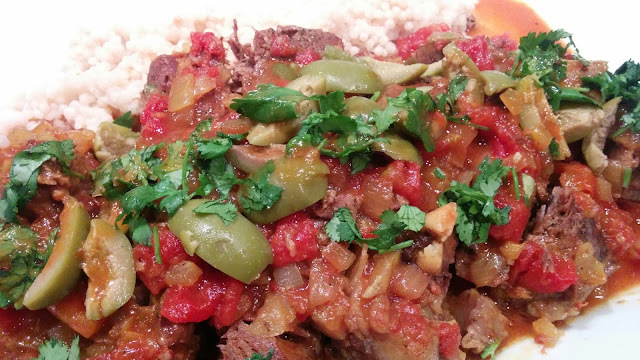 I decided to call this "savory" Moroccoan because most Moroccan dishes have an element of sweetness, but not this one. I've done a very different Moroccan Pot Roast before in 2011. It's one of our family favorites, however it has different flavors for sure. You can buy Preserved Lemons, or make them with my recipe here. Salt and pepper a pot roast, cutting some slits into the roast and pushing the garlic into them. In a large dutch oven over medium high heat, sear the roast getting some brown crust on each side. Put on a plate and reserve for later. 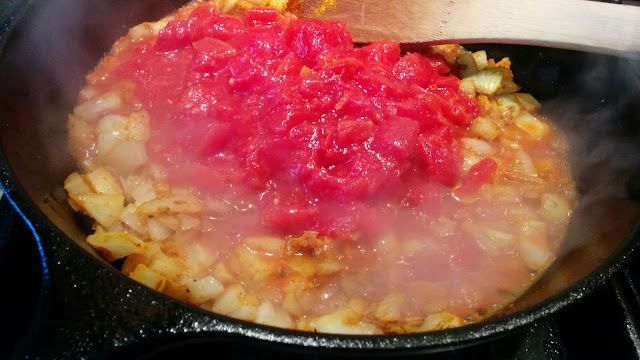 In the same pan, saute the onions until starting to soften and brown. Add in the turmeric, ginger, minced preserved lemons, broth (or water) and the tomatoes. 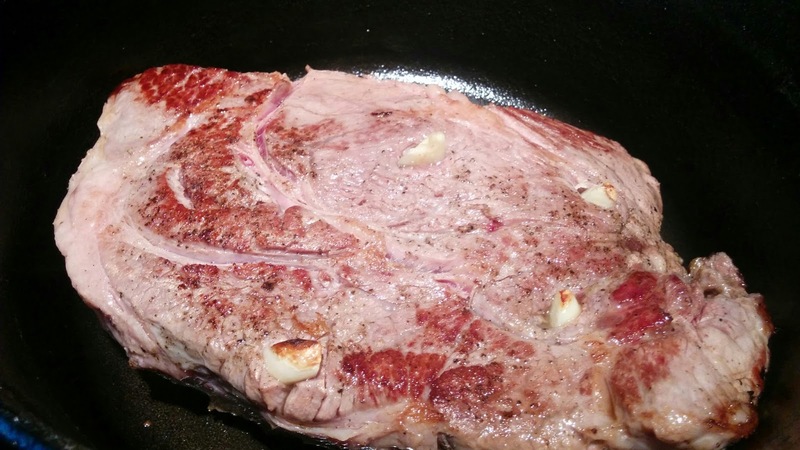 Bring to a boil, add the meat back to the pan. Cover and remove from the stove top. Bake at 350 for 2-3 hours. 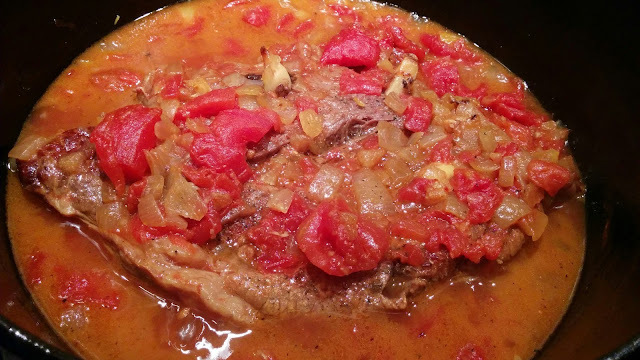 The pot roast is done when it's very tender and slices, or shreds easily. Taste the sauce, adjusting for more salt and pepper, if needed. 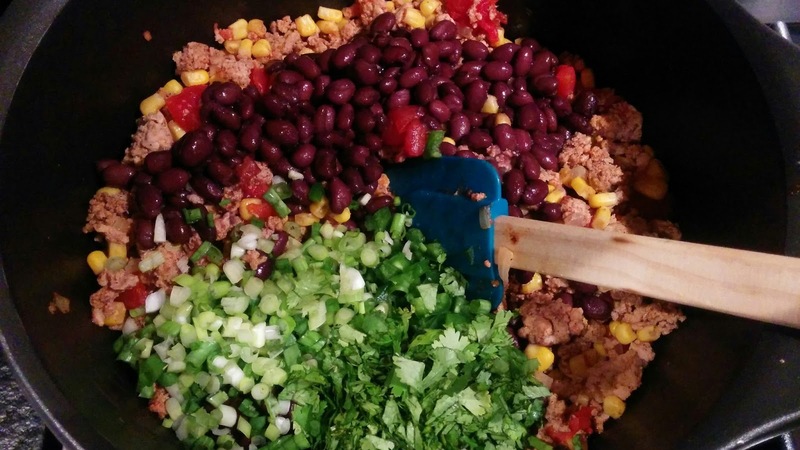 Add the cilantro and the olives. Serve over cous cous. Farro isn't a grain that everyone knows, but it's a chewy, nutty grain that is very satisfying. Mixed with a bit of crunch from walnuts and celery, sweetness from honey and cherries and tangy goodness from lemon and dijon mustard. As you can see from the photo I used whole frozen black cherries in this salad... I just couldn't wait until next Summer to get fresh cherries! However, I must say I think this salad would also be good with other fruit like peaches, or orange sections. Use your imagination, what have you got, what do you like? I served this at room temperature as a side dish for my Bourbon glazed chicken. It would also be great for lunches, or even as a meatless entree with a green salad, or some soup, on the side. 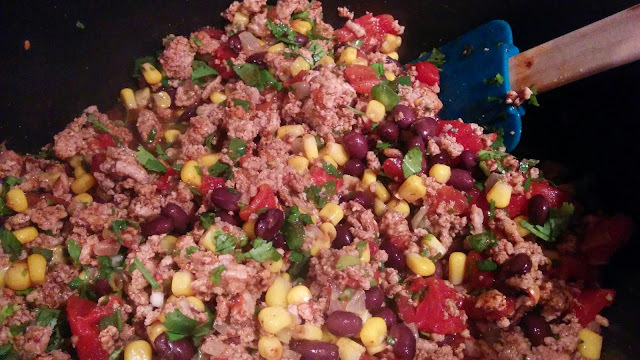 The original recipe came from Cooking Light in 2013. NOTE- You can buy farro in the whole foods bulk section, or at Trader Joe's, like I did. NOTE NOTE- Farro is not gluten free, but is more easily digestible than most wheats. Bring 5 cups water to a boil in a large saucepan. Add farro and 1/4 teaspoon salt to boiling water; cook 15 minutes or until al dente. Drain; cool at room temperature 15 minutes. 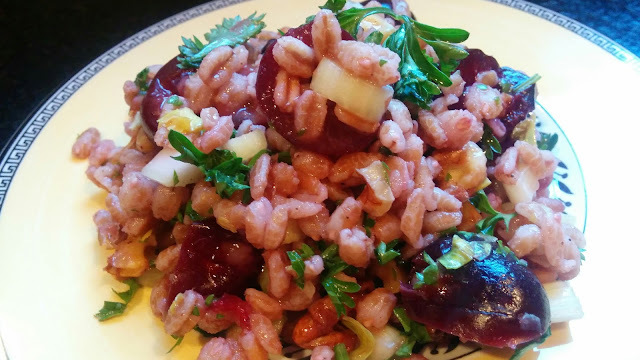 Combine farro, cherries, celery, walnuts, and parsley in a large bowl. Combine lemon juice, mustard, honey, pepper, and remaining 1/4 teaspoon salt, stirring with a whisk. 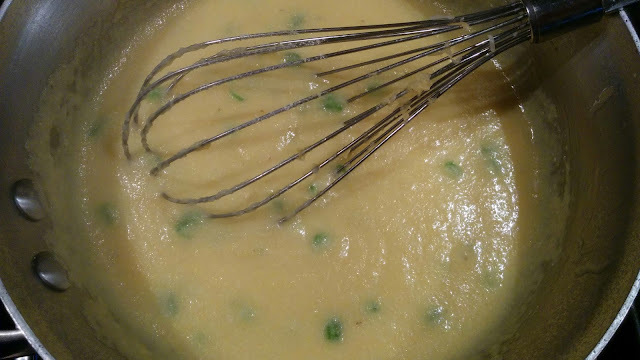 Gradually add oil, stirring constantly with a whisk. 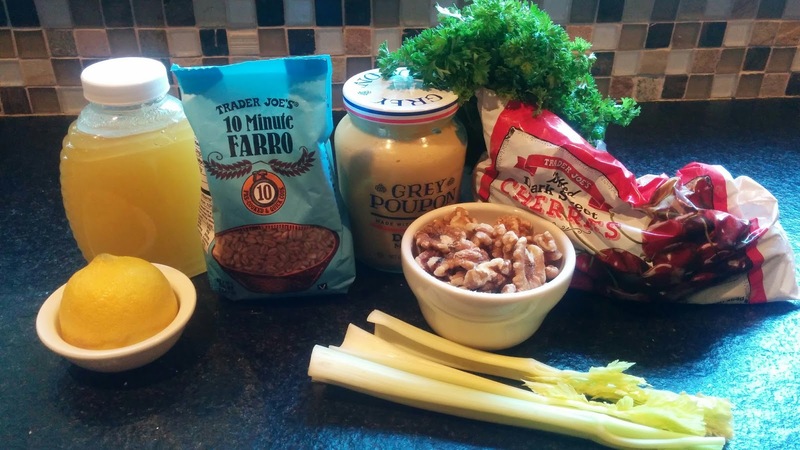 Pour dressing over farro mixture; toss to coat. Add salt and pepper to taste. Need some other ideas for farro? I know this isn't a recipe. It's more of a sandwich suggestion. I mean really, this is three ingredients and a smear of butter. I felt decadent, and happy, no one to please but me. 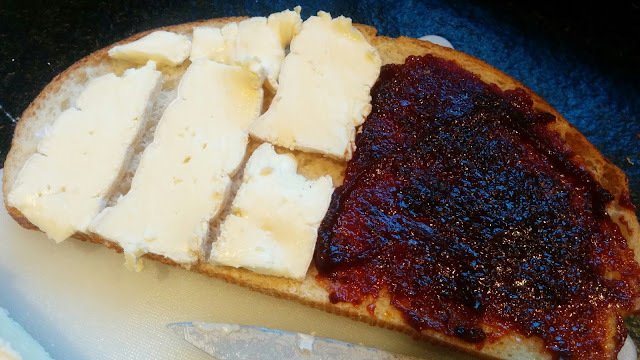 The first time I ever had cheese and jam was about 35 years ago in the UK when staying with a Dutch family. I thought it was the strangest combination, until I ate it. It tastes amazing... 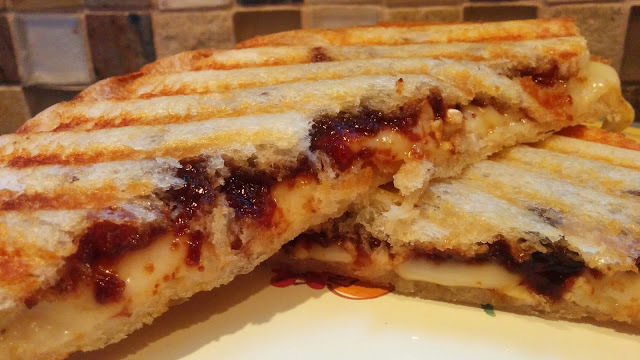 I think this panini would be equally yummy with Dubliner (Extra Sharp white cheese) with some apricot or strawberry jam. Use your imagination. It's all good. Using a panini maker, or a frying pan on medium low heat, cook slowly until the outside is crispy and the cheese is soft and oozy. I used an extra large slice of sourbough "boule" bread, cut in half. This one is the ultimate comfort food FAST. If you have the ground turkey on hand then this one comes together very quickly. You can easily customize it with what you have on hand. I used canned stuff, but easily could have used fresh or frozen. The brilliant part of this is the topping of cornmeal cooked up with jalapeno and some cheese. It's a simple thing to do. You could serve this right away, but it's especially nice topped with more cheese and cooked up bubbly in the oven. I used individual dishes, like mini pot pies, but an 8x8 pan would work just as well. NOTE: I show the butter to be used with the polenta/tamale topping, but I completely forgot about it and didn't add it. I'd say it's up to you, it would be delicious with it, but if you want to keep this dish lower fat, then leave it out. My suggestion would be to make sure that the polenta/tamale topping tastes yummy before you add it on top of the turkey mixture. Add salt and pepper and taste it. Fry up the ground turkey and the onions over medium high heat. Cook until no longer pink. Drain off any extra liquid. Drain the tomatoes, beans (rinse and drain) and the corn. Mix in the jalapeno and the green onion. Add the cumin and the chili powder. Add a little salt if needed. 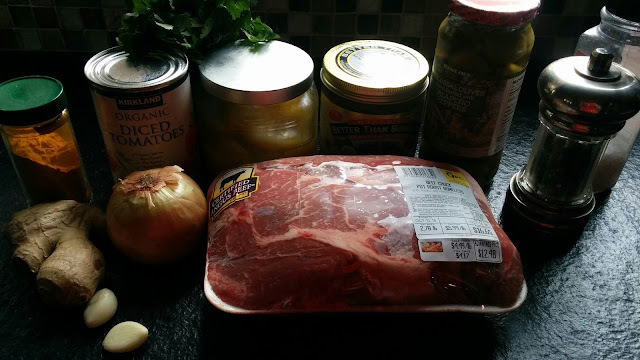 Add the meat mixture to a dish, or dishes. In a saucepan, heat up the water or broth and the butter until almost boiling. With a whisk stir the liquid while sprinkling in the cornmeal. Stir to combine. 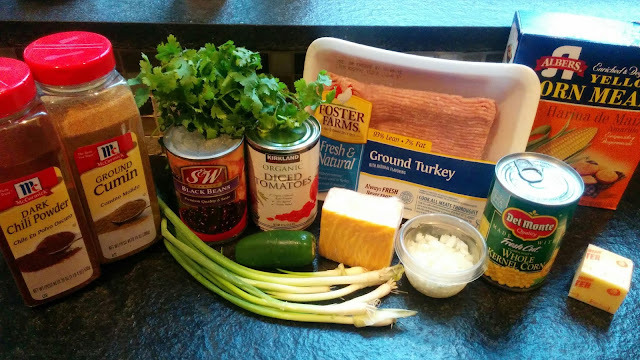 It will take 2-3 minutes to thicken. 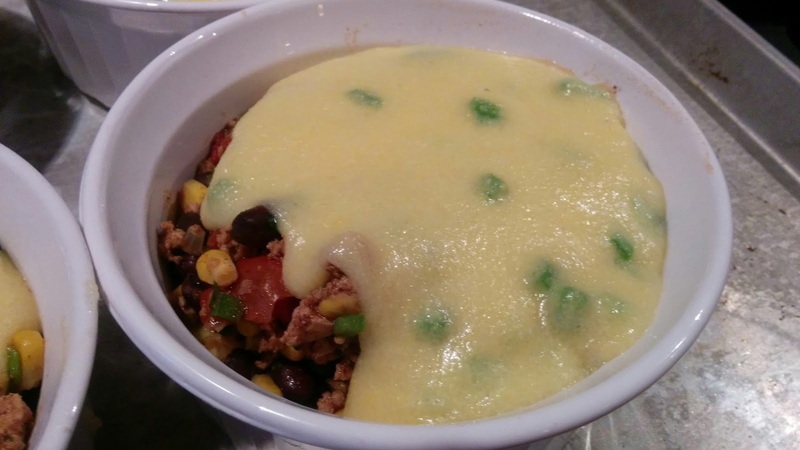 Add in the cheese and the jalapeno, stir to combine. Taste and add salt and pepper if needed. Pour over the meat mixture. Top with a little more cheese and bake for 10-15 minutes at 400 until it's bubbling and the cheese is starting to brown. I don't think I've ever followed a recipe for scrambled eggs before. Before now that is, this one was in Bon Appetit a while ago and it just struck a cord with me on its simplicity. 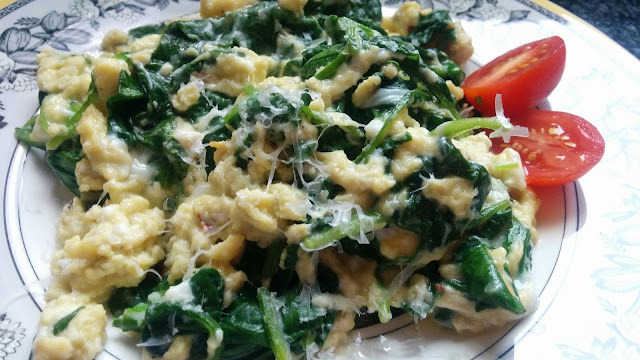 We almost always have spinach hanging around, so I thought this is a great way to get a little extra vitamins in your breakfast. A little cheese and some spice from red pepper flakes makes it totally yummy. NOTE: Pull the eggs off the heat when they still look a little loose, a little underdone. As they sit, the carryover cooking will do the rest. You want them soft, and not dry and hard. Whisk eggs in a small bowl; season with salt and pepper and set aside. Heat oil in a medium nonstick (or cast iron) skillet over medium. 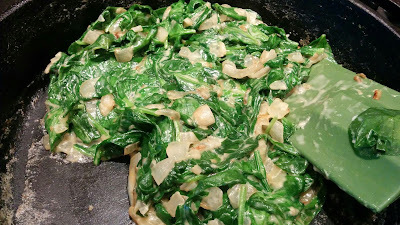 Add spinach and cook, tossing, until wilted, about 1 minute. Add eggs; cook, stirring occasionally, until just set, about 1 minute. Stir in Parmesan. Sprinkle with red pepper flakes. 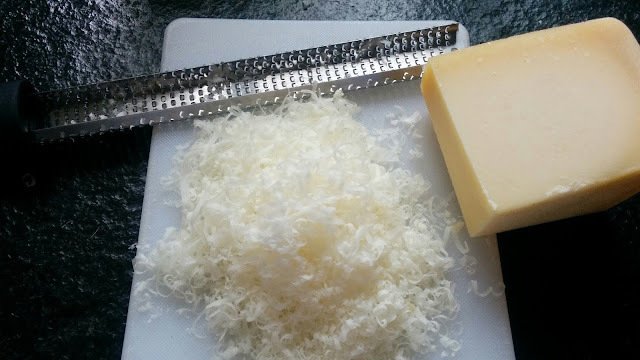 I like to use my microplaner for grating hard cheese like Parmesan. 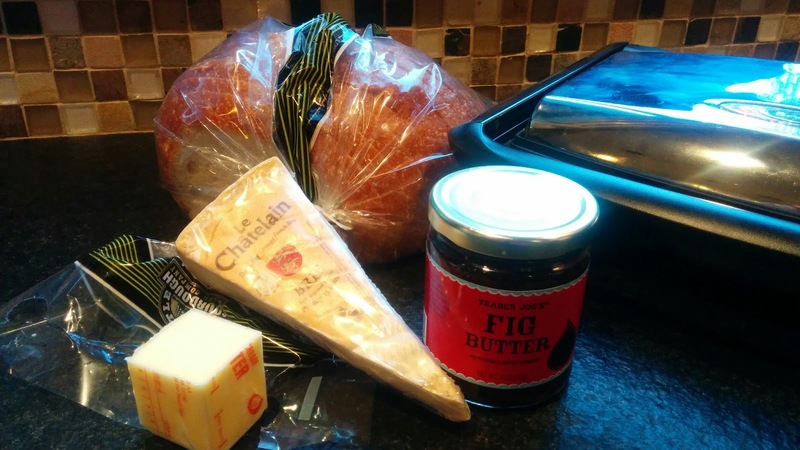 It makes the most delightful fluffy pile of cheese. I jammed as much spinach as would fit in my cast iron pan. Seems like about 5 cups, but I'm not sure. I stirred everything together for about 1-2 minutes, and served at once with a sprinkling of a little more cheese. First of all, make it easy and make a small pitcher. I mean, really? You're not doing these by yourself are you? Get out some shot glasses, and a small jug and whip up a batch of these bad boys. Remember, tequila makes your clothes fall off. 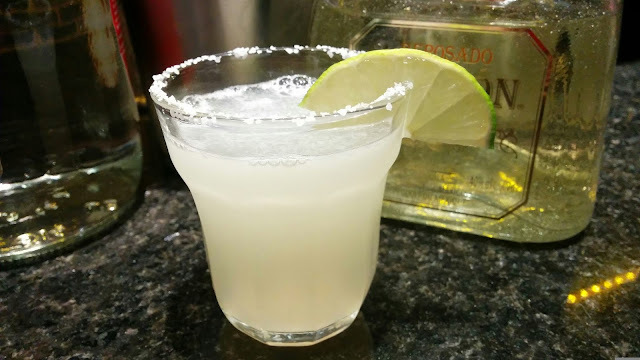 NOTE: This makes a very tart, not too sweet margarita, which is my fave! 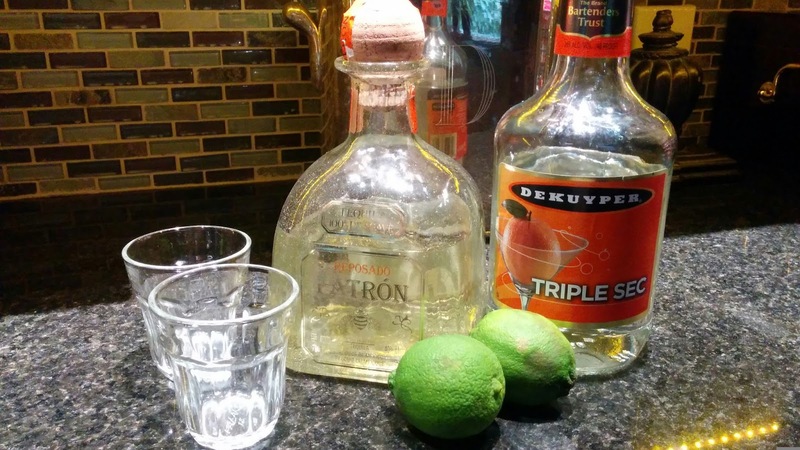 However, if you want some less tangy, use only 1 lime and an extra splash of triple sec. NOTE NOTE: You could just as easily make this into a martini, or serve over the rocks. Mix in a martini shaker with ice, strain into a salted rim shot glass. 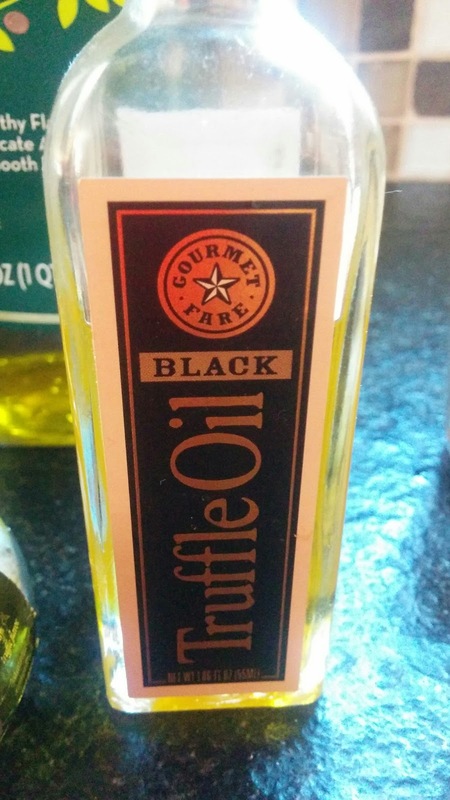 We're kind of freaky for truffle oil are our house. The funniest thing is that we use it most on popcorn! I've been intending to blog at that eventually. However, the truffle oil was on the counter as I was prepping to head out to a friends with an appetizer for a party. As I just needed something else to bring, I thought about roasting some nuts with the truffle oil! 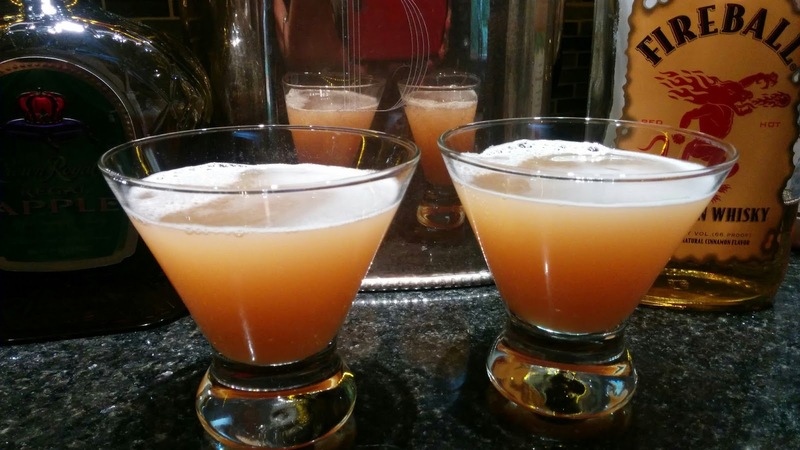 These were a big hit at the party so I thought I would blog about it. I buy in the oil section in most better grocery stores but you can order it off of Amazon which is probably easier than searching through the store. It's about $12, and lasts a long time as a little goes a long, long way. 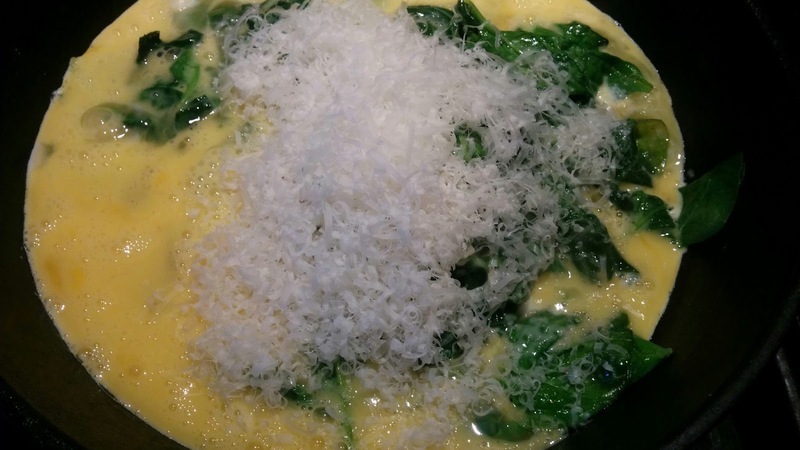 Polenta with Truffle Oil & Arugula. 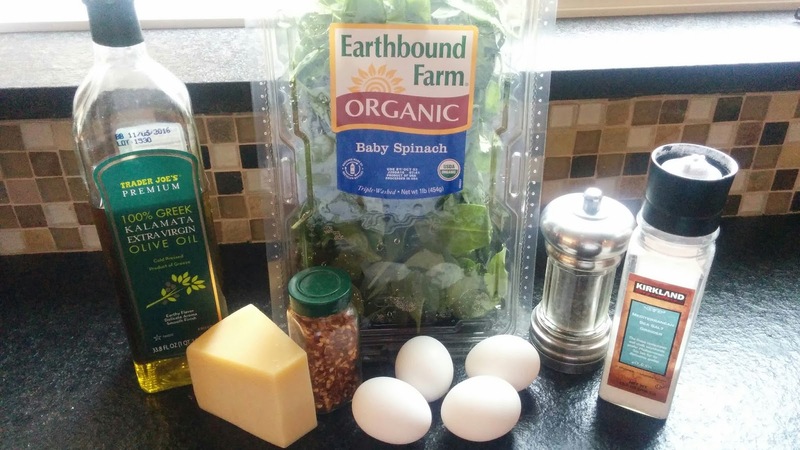 I also use a couple drops in salads with a light vinaigrette. 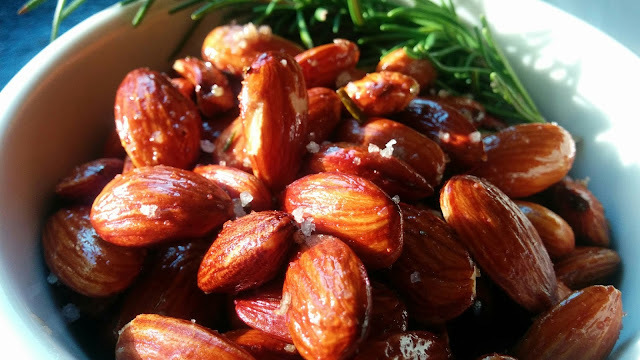 Mix well the almonds with oils and spread out on a sheet pan. Add the rosemary and sprinkle with salt. Roast for about 15 minutes, stirring every five minutes. Let cool, stir to redistribute and sprinkle with more salt. I found they needed more salt than I expected. Easy as pie to make too with only 3 ingredients. Tastes like Autumn: rainy days, colorful leaves and cozy fireplaces, hanging with your buddies. I must admit, I do love Crown Royal, the regular, the Black, the Maple. 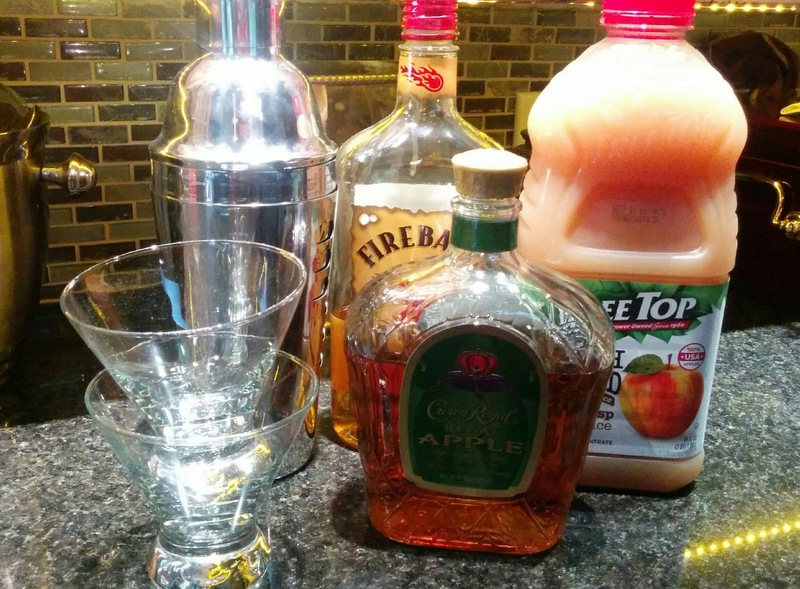 So, of course, we bought the Apple Crown Royal. However,I did NOT like the Apple Crown Royal and every time I looked in the liquor cabinet I felt a bit guilty for not liking it. So, I am thrilled to use it in this awesome cocktail! You could pre-make this for parties, tail-gating or whatever. Serve it shaken and strained for a martini, over ice in a rocks glass or shots. Serve over ice, or shake in a martini shaker and strain into a martini glass. 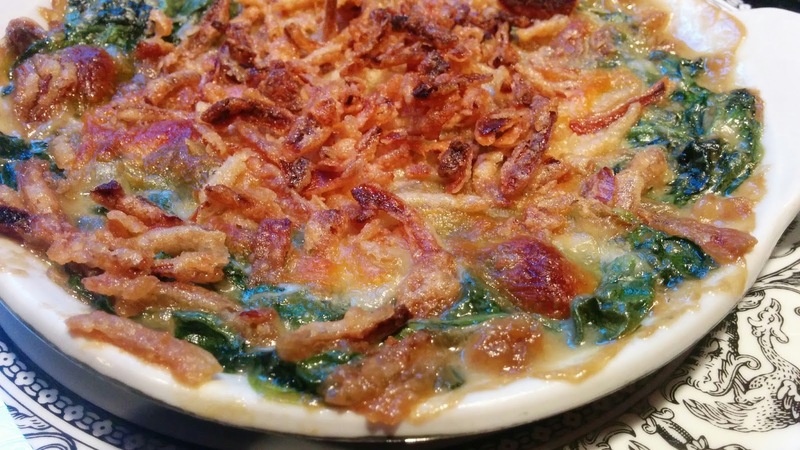 I am NO fan of the famed Green Bean Casserole for Thanksgiving. I respect that it may be a favorite of yours. I get that. I just don't want it. 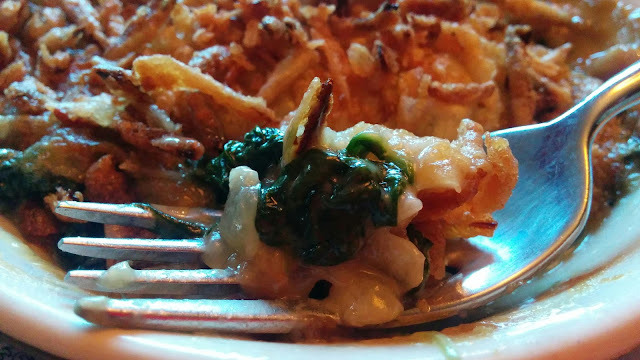 Creamed Spinach with French Fried Onions. Maybe you'd want this one too. It contains no icky canned creamed condensed soup either. 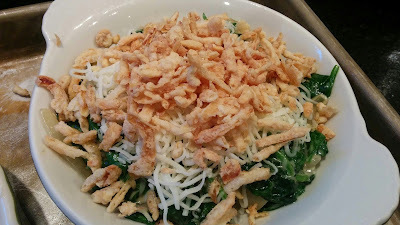 My inspiration for this dish (besides a huge new tub of baby spinach from Costco?)? I will admit to having a half used container of French's Fried onions in my fridge longer than someone should. I think I used them on a salad this Summer sometime.. but really what do you do with leftover french fried onions besides nibble on them as you peruse the fridge's contents of the fridge wondering WHAT is for dinner tonight? Sorry, no picture of the ingredients today... this recipe came together too fast and I had not intention of blogging it until I took the first bite. Preheat oven to 375. 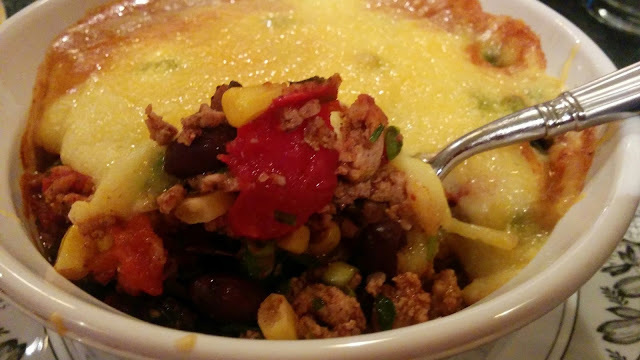 Get a small baking dish, or 2 small individual dishes ready to go. Saute onions in butter until wilted and starting to brown. Add the flour, and stir. 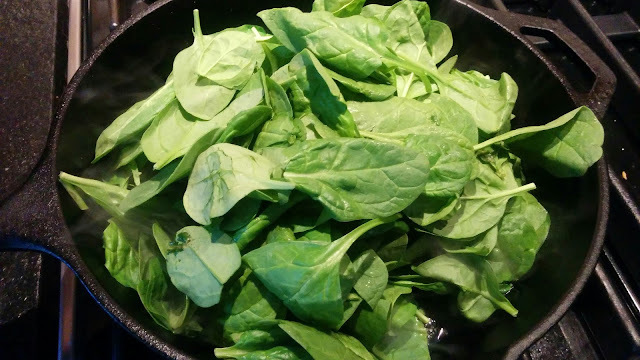 Add half & half, a pinch of salt, and stir adding the spinach, stirring to wilt. Add to mini baking dishes, add cheese then fried onions. Bake for 20 minutes, or until bubbly.